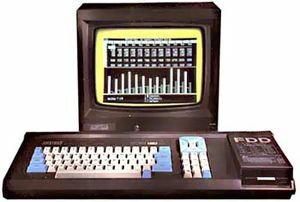 First came the CPC464, the father of the CPC family, released on the 21st June 1984(with production ceasing in 1990). This model used an integrated tape recorder and offered 64KB of RAM. 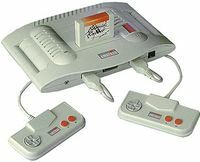 It sold around two million units in Europe and, technologically-wise, was more impressive than the ZX Spectrum and on a similar level with the Commodore 64. (One notable exception was the sound chip; while the C64 employed the splendid custom SID chip, Amstrad opted for a generic sound chip - AY-3-8912 - with unremarkable features. That said, the firmware of the CPC was leagues ahead of the C64.) At its core was a Z80 clocked at 4MHz - though screen display considerations, and the particular design of the Gate Array limited this to an effective 3.3MHz in practice - while the display was managed by the 6845 CRTC along with a gate-array chip. 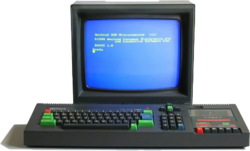 The CPC 472 was a Spanish version of the CPC 464 with an additional, non-functional 8KB RAM. A Spanish law required that every computer with up to 64KB should have extra keys for the Spanish language, or an extra tax would be levied. So Amstrad soldered in an extra 8kb which was not, however, usable by the machine since it was not connected to anything else. Later on Amstrad released a 472 with a proper Spanish keyboard. After the rule changed there was also a CPC472 with non-Spanish keys available for a very short time. The CPC 472 is very rare. Shortly afterwards, Amstrad launched the CPC6128 for the American market only, through its distributor Indescomp. The new machine sported 128k of memory and a still more sober appearance, but was otherwise identical to the 664. Despite initial denials, the machine was launched in Europe shortly afterwards, replacing the 664 for the same price - a situation which understandably irritated some of those who had recently purchased 664s. As well as the CP/M 2.2 and DR Logo that had shipped with the DDI-1 and the CPC664, the 6128 came bundled with CP/M Plus (with the GSX graphics extension) making it an appealing all-round computer at a low price. Though the 128KB of memory could not be accessed all at once from BASIC (due to limitations of the Z80), the upper 64KB could be used readily from machine code courtesy of an upgrade Gate Array. A bundled program, Bankman, provided some access from BASIC. The presence of this extra memory and the clever design of Amstrad's CP/M Plus implementation allowed for a TPA (Transient Program Area) of 42KB, more than enough to run all CP/M software. 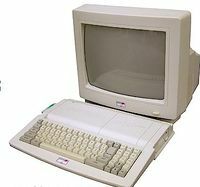 At the same time, Amstrad was designing the immensely successful PCW word-processor series, also with software by Locomotive Software and featuring an all-in-one Z80-based design. Described as a solution of 'too little, too late', this was Amstrad's second effort to prolong the life of its 8-bit computer series in the face of fierce competition from new 16-bit machines (notably, the Atari ST and the Commodore Amiga). The Plus series were mostly (but not quite 100%) compatible with the original CPC computers, and incorporated a list of new features, like a cartridge port for instant program loading, DMA for the AY soundchip, hardware scrolling, programmable interrupts, 16 hardware zoomable sprites (not vectorized) with an independent palette of 15 colours, and a choice of 4096 colours all in a new, sleek case which mimicked the keyboard-computer design that was en vogue in the 16-bit market (ST, Amiga etc). While the Amstrad Plus computers were arguably one of the best 8-bit computers ever built for the mass market, they died an early death as the 16-bit era had well and truly begun. By 1990 Amstrad had realised that the home market was heading towards the 16-bit machines, on one hand, and towards the new generation of game consoles like the Sega Master System or the Nintendo Entertainment System, on the other. Therefore, just as they created the 464 Plus and 6128 Plus to compete against the ST and the Amiga, they also created a stripped-down variant called the GX4000. The GX4000 was, in essence, a Plus motherboard in a new case, with no keyboard, cassette deck or disc drive, and with most extension ports gone - save for the cartridge port and two joypads. This page was last modified on 19 September 2016, at 02:16.